Kevin Arnold knows his days as an amateur boxer are numbered. So if he’s going to accomplish anything in the sport, now’s the time. He’s 28 and trying to get to the Golden Gloves Tournament of Champions in May at Salt Lake City. On Sunday, Arnold took the first step toward that goal when he won the 165-pound weight class at the Nevada State Golden Gloves at Santa Fe Station. Arnold, who fights out of Barry’s Boxing Club, won his third straight state title, defeating Zaquan Peterkin by split decision. Arnold has lost the last two years at regionals, and he said to win at that level it’s about staying busy and putting pressure on your opponent. That’s what he forgot to do in the first round Sunday as Peterkin, who fights out of Johnny Tocco’s Gym, dictated the tempo. But in the second round, the fight changed as Peterkin missed with a punch, dropped his left hand and was decked by Arnold with a chopping, overhand right. Arnold found boxing the hard way. At 14, he had moved to Las Vegas from Los Angeles where he had been constantly getting into trouble. He was with his mother and grandmother but even whith a change of scenery he was still running afoul of the law. Pat Barry, who was a detective with the Metropolitan Police Department at the time, found himself dealing with the troubled teenager. It was Barry who suggested Arnold look at channeling his energy into boxing. He had Arnold come by his gym on South Highland Avenue and he fell in love with the sport. Arnold has been boxing for 14 years and he’s determined to make it to gthe Golden Gloves nationals. But first, he needs to win the regional tournament, scheduled for March 19 and 20 at the Santa Fe. 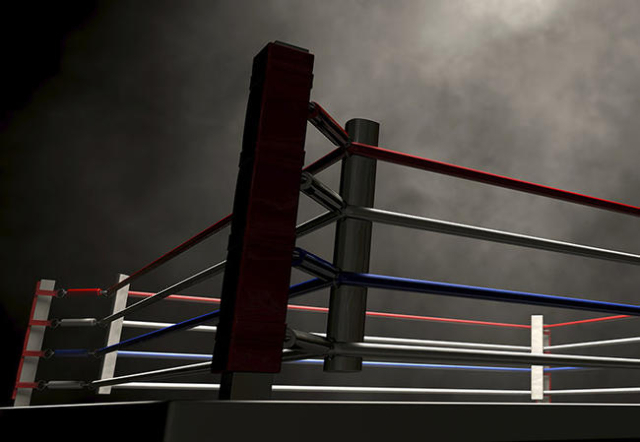 Boxers from Nevada, Arizona, Washington and Oregon will compete that weekend for a spot in the national tournament, which is May 16-21. Two titles remain to be decided. Both will be decided at noon today at Barry’s Boxing as Jose Montoya faces Alec McGee for the 123-pound state championship. McGee defeated James Browning by split decision to advance to the final. In the 141-pound weight class, Freudis Rojas meets David Sample Jr. after Sample won a split decision over Trea Talton.